Includes English Pale Ales, American Pale Ales and Belgian Pale Ales which are described below. This style was originated by producers in Burton in the 1800's. High levels of calcium found in Burton's water complement this style well by enabling a more efficient extraction of bitter resins from the hops. Non-Burton producers add "Burton salts" to their water to replicate this desirable trait. Burton yeasts are unusually fine, remaining in suspension for a thorough fermentation. Taste and aroma are very similar to the bottled equivalent of an English Bitter. Hoppiness is not generally as pronounced as with Bitters. The term 'pale' was originally intended to distinguish beers of this type from the black London Porter. Classic English Pale Ales are not pale but rather are golden to copper colored and display English variety hop character. High hop bitterness, flavor and aroma should be evident. They are well attenuated. Dry hopping is common. This medium bodied pale ale has low to medium maltiness. Low caramel is allowable. Fruity ester flavors and aromas are moderate to strong. Chill haze is allowable at cold temperatures. Diacetyl (butterscotch character) should be at low levels or not perceived. American Pale Ales range from golden to lights copper colored. The style is characterized by American variety hops used to produce high hop bitterness, flavor and aroma. Dry hopping is appropriate. These beers are slightly less malty than their British counterparts. American Pale Ales have medium body and low to medium maltiness. Low caramel character is allowable. Fruity-ester flavor and aroma should be moderate to strong. Diacetyl should be absent or present at very low levels. Chill haze is allowable at cold temperatures. Steak, leg of lamb, burgers, pheasant stuffed with wild rice and mushrooms. Belgian Ales are similar to British Pale Ales but are more spicy and aromatic both in malt and yeast character. They are often labeled as spéciales belges as ale is not a term commonly employed in Belgium. Belgian-style Pales Ales are characterized by low, but noticeable, hop bitterness, flavor and aroma. Light to medium body and low malt aroma are typical. They are golden to deep amber in color. Noble hop types are commonly used. Low to medium fruity esters are evident in aroma and flavor. Low caramel or toasted malt flavor is acceptable. Diacetyl should not be perceived. Chill haze is allowable at cold temperatures. This historic style evolved when British brewers were making beer for export to India. The style is marked by very high hop bitterness and high alcohol content. The high gravity of this beer allowed it to mature during the voyage. The intense hops helped preserve the beer. A high hopping rate and the use of water with a high mineral content results in a crisp, dry beer. This golden to deep copper colored ale has a full flavor (in addition to the hop bitterness). India Pale Ales possess medium maltiness and body. Fruity-ester flavors and aromas are moderate to very strong. Chill haze is allowable at cold temperatures. Amber/Red Ales are an emerging style with may varied definitions. American Amber Ales range from light copper to light brown in color. Amber Ales are characterized by American varietal hops and to some connoisseurs should be used to produce high hop bitterness, flavor and aroma. Others believe that Ambers should be defined more by malt than by hops. Amber Ales have medium to high maltiness with medium to low caramel character. They should have medium body. The style may have low levels of fruity-ester flavor and aroma. Diacetyl should be absent or barely perceived. Chill haze is allowable at cold temperatures. Special Bitter is more robust than Ordinary Bitter. It has medium body and medium residual sweetness. In addition, the Special Bitter has more hop character than Ordinary Bitter. Extra Special Bitter processes medium to strong hop qualities in aroma, flavor and bitterness. The residual malt sweetness of this richly flavored, full-bodied bitter is more pronounced than in other bitters. Scotch ales are full bodied, malty and lightly hopped. To highlight the maltiness, Scots often do not ferment the beers thoroughly leaving behind more of the malty notes and residual sugars. Perhaps they like to spotlight the malt due to their tradition of growing high quality barley also used for Scotch distilling. Low-gravity Scotch Ales are found in the North East of Scotland, higher-gravity examples are found in Belgium and the Caribbean. Includes Scottish Light, Heavy and Export Ale which are described below. Scottish Light represents the mildest form of Scottish Ales. Little bitterness is perceived. Scottish Light Ales are light bodied. Very low hop bitterness is acceptable, and hop flavor or aroma should not be perceived. Chill haze is acceptable at low temperatures. Scottish Heavy Ale is moderate in strength and is dominated by a smooth sweet maltiness balanced with very low, but perceptible, hop bitterness. It has medium body, and fruity esters are very low, if evident. Chill haze is acceptable at low temperatures. Scottish Export Ale is sweet, carmel-like and malty. Its bitterness is perceived as low to medium. It has medium body. Fruity-ester character may be apparent. Chill haze is acceptable at low temperatures. An Ale-hybrid that developed during the lager take over of the early 1900's. Examples found these days are usually a faint interpretation of the original style. Golden Ales and Canadian-style Ales are a straw to golden blonde variation of the classic American-style Pale Ale. However, Golden Ale more closely approximates a lager in its crisp, dry palate, low (but noticeable) hop floral aroma and light body. A slightly creamy character would not be out of place, nor are light spiciness and graininess. Perceived bitterness is low to medium and may exhibit some complexity. Fruity esters may be perceived due to the top fermenting yeast, but do not predominate. Chill haze should be absent. The term Kolsch is the best protected of all in the beer world. Only traditional brewers around Colon, Germany are legally allowed to use the style name for their beers. Kolsch is warm fermented and aged at cold temperatures (German ale or Alt-style beer). Kolsch is characterized by a golden color and slightly dry, winey and subtly sweet palate. Caramel character should not be evident. The body is light. This beer has low hop flavor and aroma with medium bitterness. Wheat can be used in brewing this beer that is fermented using ale or lager yeasts. Fruity esters should be minimally perceived, if at all. Chill haze should be absent or minimal. This is a fine and delicate beer that is well attenuated. Maturation is typically 2 - 6 weeks. The local custom in Germany is to serve these beers in small, narrow 20cl glasses to suggest something light and appetizing. Mild Ales originated in coal mining regions of England and Wales. Mild Ale was intended as a low alcohol beer for heavy consumption by miners and as a harvest time drink for farm workers. They are often the least expensive beers available. Mild Ale is sweeter and lighter colored than Porter. It is as malty as possible in a low gravity beer. This style is most common in the West Midlands of Great Britain. It had been declining as a style due to a perception as old-fashioned. It now seems to be making a comeback. Mild refers to bitterness not flavor. They can be full of flavor whether light or dark. Includes English Light and Dark Milds which are described below. English Light Mild Ales range from light amber to light brown in color. Malty sweet tones dominate the flavor profile with a little hop bitterness or flavor. Hop aroma can be light. Very low diacetyl flavors may be appropriate in this low-alcohol beer. Fruity ester level is very low. Chill haze is allowable at cold temperatures. English Dark Mild Ales range from deep copper to dark brown (often with a red tint) in color. Malty sweet, caramel, licorice and roast malt tones dominate the flavor and aroma profile with very little hop flavor or aroma. Very low diacetyl flavors may be appropriate in this low-alcohol beer. Fruity ester level is very low. Includes English, American, Belgian and Dusseldorf-style Brown Ales which are described below. English Brown Ale Back in the time when most beers were darker (1920's), Newcastle presented their reddish brown ale to compete with the Pale Ales of the day. This style has proven so enduring that it has sparked many copycats and has lead to the emergence of a new style. These nuttier Brown ales are very different from the older brown ales from the London area, which are lower in alcohol, darker and sweeter. English Brown Ales range from deep copper to brown in color. They have a medium body, and a dry to sweet maltiness dominates with very little hop flavor or aroma. Fruity ester flavors are appropriate. Diacetyl should be very low, if evident. Chill haze is allowable at cold temperatures. Nutty stuffings, nutty crisp salads, cheesy salads, apple pie, pork with brown sause, beef vegetable soup. American Brown Ales look like their English counterparts but have an evident hop aroma and increased bitterness. They have medium body, and estery and fruity characters should be subdued. Diacetyl should not be perceived. Chill haze is allowable at cold temperatures. This term describes a style found in East Flanders around Qudenaarde. Flemish Brown Ales exhibit complex malt character, a suggestion of caramelization, water high in sodium bicarbonate, multi-strain yeasts and blending of old and new batches to add to the complexity of tastes and textures. The finished product exhibits a sour/ sweet character. A light- to medium-bodied deep copper to brown ale is characterized by a slight vinegar or lactic sourness and spiciness. A fruity estery character is apparent with no hop flavor or aroma. Flanders Brown Ales have low to medium bitterness. Very small quantities of diacetyl are acceptable. Roasted malt character in aroma and flavor is acceptable at low levels. They are both refreshing and appetite-arousing. Serving Temperature Cool cellar temperature. Ale Alt Beer is Germany's equivalent to the ales of England. Although one will mostly encounter lager style beers in Germany, Germany originally produced ales as did everywhere else. This style is a hold out against lagers from the old days. These are very balanced beers with the fruitiness restrained against the bitterness. Cold maturation produces a relatively smooth palate. Alt Beir is typically found around Düsseldorf in Germany. Alt Bier is served in short stubby glasses. As one is finished the waiters of this area will automatically replace it. The only way to stop is to place a coaster over the empty beer glass! Brown in color, this German ale may be highly hopped (though the 25 - 35 IBU range is more normal for the majority of Altbiers from Dusseldorf) and has a medium body and malty flavor. A variety of malts, including wheat, may be used. Hop character may be evident in the flavor. The overall impression is clean, crisp and flavorful. Fruity esters should be low. No diacetyl or chill haze should be perceived. The Berliner wheat beers are the most refreshing of all wheats. They have modest alcohol content, light body and an acidic-clean character. It is often described as champagne like. Berliner Weisse is matured for 2 months to 5 years which develops its delicate fruity complexity. It is made with relatively low wheat content and no perceptible hop bitterness. Special lactic cultures are added with the top fermenting yeast. This technique softens the acidic tones. These beers are often served with syrups such as raspberry or woodruff. These syrups are deemed necessary to moderate the intense acidity. These are the lightest of all German-style wheat beers. The unique combination of a yeast and lactic acid bacteria fermentation yields a beer that is acidic, highly attenuated and very light bodied. The carbonation of a Berliner Weisse is high, and hop rates are very low. Fruity esters will be evident. No diacetyl should be perceived. Porter was originally brewed in Britain back in the early 1700's and was known as "entire" because it combined the characteristic of several different beers of the time. Because this beer became popular with porters nearby, they became known by the same name; Porters. The popularity of Porters came at the same time as the industrial revolution. Before this period beer was sold primarily from brewpubs, but now beer began to be sold abroad. Porter and the similar Stout style became known throughout the world especially wherever the British empire was established. Many foreign beers are still patterned after this style. In recent years Porters have begun to make a comeback in their original home turf of London after a period of decline. The decline may have been due to war time restriction on the roasting of malted barley. There are a number of Porters now produced in the United States at microbreweries and brewpubs. Porters are mild to dark brown (may have a red tint) in color. Porters range in flavor from bitter to sweet. The dark color comes from the use of black or roasted malt rather than the roast barley feature of stouts. The roast malt flavor and aroma character should be evident and can vary from an assertively strong (but not stringent) character to suggestively mild. This is a medium-bodied beer. Fruity esters should be evident and in proportional balance with roast malt and hop bitterness character. Hop flavor and aroma may vary from being negligible to medium in character. Includes Irish Dry, Sweet/Milk, Oatmeal and Imperial Stouts which are described below. Includes Irsih-style and Foreign-style Stouts. The big difference between Stouts and Porters is the use of roasted unmalted barley in Stouts rather than the roasted malted barley used in Porters. This often gives the drink a more grainy flavor. Other characteristics include evident hop bitterness and a fruity acidity. The style has been heavily influenced by the king of Stout producers, Guinness. Guinness has been producing Porters and Stouts since the 1700's. Due to the popularity of their Stouts, they dropped Porters from their product line altogether after World War I. The key differentiating factor of Dry Stouts as a style is the heavy hopping. The roots of this tradition probably are related to the need to store the beer for long periods before the time of refrigeration. The high gravity of the stout and the long distribution times required a secondary fermentation in the barrel. To protect the beers from micro-organisms, they were heavily hopped. The hops then acted as a preservative. Today they are part of the styles character. Dry Stouts have an initial malt and caramel flavor profile with a distinctive dry-roasted bitterness in the finish. Dry Stouts achieve a dry roasted character through the use of roasted barley. Some slight acidity may be perceived but is not necessary. Hop aroma and flavor should not be perceived. Dry stouts have medium body. Fruity esters are minimal and overshadowed by malt, hop bitterness and roasted barley character. Diacetyl (butterscotch) should be very low or not perceived. Head retention and rich character should be part of its visual character. Oysters, sushi, clams, crab, lobster. As with Classic Dry Stouts, Foreign-style Stouts have an initial malt sweetness and caramel flavor with a distinctive dry-roasted bitterness in the finish. Some slight acidity is permissible and a medium- to full-bodied mouthfeel is appropriate. Hop aroma and flavor should not be perceived. Their perception of fruity esters are low. Diacetyl should be negligible or not perceived. Head retention is excellent. Includes Sweet and Oatmeal Stouts. As brewers in other lands have added sweeteners to their beers to offset the acidity (notably fruit in Belgium beers), English brewers sometimes add sweeteners to Stouts and Porters. The sweeteners commonly used include sugar or milk sugar (lactose). Lactose is unfermentable. This addition adds to the flavors experienced in the brew. Although this style is no longer matured the sugar is added as a primer before bottling. Therefore Sweet Stouts are pasteurized to prevent unwanted additional fermentation. Sweet Stouts have less roasted bitter flavor and more full-bodied mouthful than Dry Stouts. The style can be given more body with milk sugar (lactose) before bottling. Malt sweetness, chocolate and caramel flavor should dominate the flavor profile. Hops should balance the sweetness without contributing apparent flavor or aroma. Oatmeal Stouts have a firm, smooth body including a suggestion of nuttiness in their coffee, chocolate and roast flavors. These Stouts came into being during a period when Stouts were viewed and marketed as being nutritious for the body. Oatmeal Stouts typically include oatmeal in their grist, resulting in a pleasant, full flavor and smooth profile that is rich without being grainy. Roasted malt character of caramel and chocolate should be evident, smooth and not bitter. Bitterness is moderate, not high. Hop flavor and aroma is optional but should not overpower the overall balance. This is a medium- to full-bodied beer, with minimal fruity esters. This style emerged during the great days of Stouts and Porters. High gravities and warm fermentation were utilized to create a beer that would travel. In the late 1700's this style began to be exported to the Baltic Countries where the rich flavors and high alcoholic content suited the native tastes. In the late 1800's a Belgian began trading in beer between London and the Baltic. He made gifts of Stout to Russian hospitals earning him Imperial favor. High import duties later caused him to open a brewery in Estonia producing their beer. Perhaps this history lead to the name Russian Imperial Stout. Dark color to very black., Imperial Stouts typically have alcohol levels exceeding 8%. The extremely rich malty flavor and aroma is balanced with assertive hopping and fruity ester characteristics. Perceived bitterness can be moderate and balanced with malt character to very high in the darker versions. Roasted malt astringency and bitterness can be moderately perceived but should not overwhelm the overall character. Hop aroma can be subtle to overwhelmingly floral. Includes English, Scotch and Belgian Strong/Old Ales which are described below. These beers are typically dark, rich, and sweet with soft notes of fruit and molasses although neither are used as ingredients. Their gravity implies a high alcoholic content although they may or may not be strong. Although the gravity is high, they are not thoroughly fermented leaving behind high residual sugars to highlight the malt flavors. They tend to be full in color and rich in flavor. They are often regarded as winter warmers. Sometimes "Old" indicates that the beer has been aged, but not always. When these beers are aged, the beer's character emerges markedly. This aging through bottle conditioning may also increase the alcoholic content to 10 or 12%. Amber to copper to medium in color, English Strong Ales are medium- to full-bodied with a malty sweetness. Fruity-ester flavor and aroma should contribute to the character of this ale. Bitterness should be evident and balanced with malt and/or caramel sweetness. Alcohol types can be varied and complex. Chill haze is acceptable at low temperatures. Scotch Ales are overwhelmingly malty and full-bodied. Perception of hop bitterness is very low. Hop flavor and aroma is very low. or nonexistent. Color ranges from deep copper to brown. The clean alcohol flavor balances the rich and dominant sweet maltiness in flavor and aroma. A caramel character is often part of the profile. Fruity esters are generally at medium aromatic and flavor levels. A peaty/smoky character may be evident at low levels. Low dyacetyl levels are acceptable. Chill haze is allowable at low temperatures. Belgian Strong Ales are often vinous, with darker examples typically colored with dark candy sugar. The perception of hop bitterness can vary from low to high while hop aroma and flavor is very low. These beers are highly attenuated and have highly alcoholic character - being medium-bodied rather than full-bodied. Very little of no diacetyl is perceived. Chill haze is allowable at cold temperatures. Barley Wine is a name given to describe rural home-brewers strongest brews. These beers are top fermenting ales with alcohol content close to that of wines, that is in the 6 - 12% by volume range and occasionally more. They are usually bottled not on draft. They characteristically have strong rich flavors and work well as a winter warmer and as dessert beers. Barley Wines have a velvety texture, a fruity, smoky palate and a hint of acidity with a warm alcohol finish. This style is older than the name. In the old days casks may have been marked simply with multiple X's. Extremely high gravities combined with top fermenting yeasts make for a wine-tasting brew. These beers are often aged for 18 months or longer to mature the flavors. Traditionally the casks were rolled once a week to help the yeasts continue their work of converting the residual sugars to alcohol. The strongest beer ever made according to the Guinness Book Of World Records was a Barley Wine. Doomsday II had an alcoholic content of 15.86% by volume. Barley Wines range from tawny copper to dark brown in color and have a full body and high residual malty sweetness. Complexity of alcohols and fruity ester characters are often high and are counter balance by the perception of low to assertive bitterness and extraordinary alcohol content. Hop aroma and flavor may be minimal to very high. Diacetyl should be very low. A caramel and vinuous aroma and flavor is part of the character. Chill haze is allowable at cold temperatures. Chocolate candy. Various desserts or as a night cap. Dark red-brown in color, these beers are thin but firm in body, sweet and sour, marvelously thirst quenching and very refreshing. There is a blend of caramels, tannins and acidity. As the beer matures in wooden casks the lactic acids builds up and reacts with the wood. These are pasteurized products. The classic Rodenbach is a blend of two beers; one a beer aged for 18 months and the other a younger brew of 6 weeks or so. The result is a wonderful, complex beer. The light acidity of these beers complements shell fish (prawn soup), pickled, raw or smoked fish and salads. They also complement rabbit, small game birds and goose liver. Bière de garde has long been noted as a minor style and in recent years has been gaining in popularity. This style is often marketed in champagne bottles. These were originally made in the spring to be consumed as summer beers. The name means "beer to keep". This style originated in Northern France near the Belgian border. They have a malt accent and restrained fruitiness with spicy notes. They are medium to strong in alcohol. Bière de garde originated in farmhouse breweries. They were originally top fermented but some utilize bottom fermenting yeasts at warm temperatures for an ale character. Often the water used is softened and light hop varieties are employed. Some are cold matured for a month or so. A term used to identify beer made in craft breweries in Wallonia. Saisons are not widely known outside their region. They traditionally were made a varying gravities to be served at family meals. They have traditionally been made to have a medium body and an aggressive flavor. Sometimes hard water is used to upgrade the body. Mashes are produced that are only partly fermentable. Flavor is accented through a generous helping of hops and sometimes spices. Although they are no longer fermented in wood, they do under go a second fermentation in the bottle. Saisons are crisp, tart beers made for the summer season and have a characteristic orange color and refreshing carbonation. They are hoppy with citric notes and fruity flavors and are excellent with food. This style is an excellent example of true craft brewing. Lamb with juniper berries goes well with sweeter beers such as these. Also try spicy sausages, hearty stews and duck. True Trappist Ales are epitomized by the brews produced by the Trappist monasteries of Belgium and the Netherlands that use the word Trappist on their labels. There are five abbeys in Belgium (Chimay, Orval, Rechefort, Westmalle and Sint Sixtus at Westvleteren) and one in the Netherlands (Shaapskooi at Konigshoeven) of the Trappist order and are associated with the development of the characteristics associated with these beers. In fact , legally, these are the only breweries that may use the word "Trappist" on the label of their beers. The brothers at these abbeys have created truly unique characteristics through careful ground breaking development and perfection of many techniques. 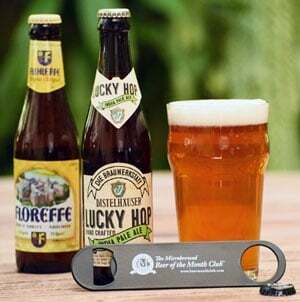 Some general procedures employed in producing these beers include the incorporation of special yeast strains that operate at higher temperatures, the use of sugar candy in the kettle, blending and bottle conditioning. There are about 20 brands being produced by these breweries which are housed within the walls of the monasteries. Some of these beers are exported and some are only produced for limited consumption local to the brewery. 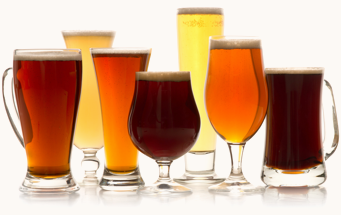 All of these beers generally can be described as fruity and aromatic. Some of them have a rummy taste derived from the use of the sugar candy. There are a number of others including abbeys from different religious orders that find inspiration from the classics that the Trappists produce. These other products produced in the Trappist style are generally known as Abbey Ales. While many of these are fine products, they generally have not achieved the depth of character of the true Trappist Ales. Trappist or Abbey Ales are often categorized as Singles, Dubbles, Tripels or Quadruples. These designations generally refer to their relative alcoholic strength. Beers that can be categorized as such, none the less will exhibit unique complexity and character depending on the brewery producing it. Visits to these breweries are by appointment only and women are not permitted as these breweries are within the monastery compounds. This section includes Single, Dubbel and Tripel Ales which are described below. This medium- to full-bodied, dark amber to brown colored ale has a malty sweetness and nutty, chocolate, roast malt aroma. A faint hop aroma is acceptable. Dubbels are also characterized by low bitterness and no hop flavor. Very small quantities of diacetyl are acceptable. Fruity esters (especially banana) are appropriate at low levels. Head retention is dense and mousse-like. Tripels are often characterized by a spicy, phenolic clove flavor. A banana fruity ester is also common. These pale/light-colored ales usually finish sweet. The beer is characteristically medium- to full-bodied with a neutral hop/malt balance. Low hop flavor is acceptable. Alcohol strength and flavor should be perceived as evident. In comparison to the Abbey Ale, it will have a cleaner, crisper character and will be stronger in alcoholic content. (Wit) "It is the orange taste and the sweet/dry spiciness that distinguishes the 'white' beers of Belgium, writes the "Beer Hunter", Michael Jackson. The best emit the aroma of Cyracao orange peel, coriander and other spices augmenting the hops. These flavors work well with the use of unmalted wheat to make these beers. These beers are often bottle conditioned with sediment found in the bottle. As such most can take two to three months aging in a cool, dark place during which the hop will recede and the orange flavors will be enhanced. They typically have a full yellow-white color, with a pale, dense head. The style is further characterized by the use of noble-type hops to achieve a low to medium bitterness and hop flavor. This dry beer has low to medium body, no diacetyl and low fruity ester content. Belgian Whites originated in a wheat growing region of Belgium and the spices may have derived from this area's affiliation with the Netherlands when many spice islands were colonized centuries ago. Includes unflavored Gueuze and fruit-flavored Lambics which are described below. Unflavored Lambic is one of the most complex beer styles in the world. Unblended lambics are an ancient beer style utilizing wild yeasts and other micro-organisms. Most products available are a blend from multiple batches of lambics, each with different characteristics due to the wild nature of these brews. Often young samples with higher residual sugars are blended with older, more seasoned examples. The term Lambic is really representative of the Zenne Valley produced products in Belgium. Although others have attempted to mimic this style, none have achieved the complexity of the products from this region. It is probably due to the unique characteristics of the microbiology of the region which are relied upon for the spontaneous fermentations associated with this style. During fermentation Lambics are left in open vats exposed to the air and the wild micro-organisms that ride its currents. As wheat grows in the area, it was utilized in brewing. Lambics are made with malted barley and unmalted wheat in the mash. Lambics are hopped in a unique manner too using old hops to avoid the assertive bitterness when using large amounts as a preservative. Lambics often spend 3 years or more undergoing chemical reactions in the barrel. They are the only style left which is typically aged in wooden barrels. Unblended natural fermented Lambic is intensely estery, sour and acetic flavored. These hazy beers are low in carbonation and are very low in hop bitterness. Cloudiness is acceptable. These beers are quite dry and light bodied. Pickled, raw or smoked fish, ceviche, sharp cheeses. Just about every Lambic brewery produces at least one Gueuze. It is the product of the melding of a young Lambic containing residual sugars with a mature example which is more attenuated and complex in its interplay of microorganisms. Further fermentation and carbonation is the result. It may be that this style originated from attempts to give a flat Lambic more life in the cask. Because of the may variables that are considered when making any type of Lambic as well as the inherent variables of nature associated with the style, there are good and bad years for lambics. There are varied interpretations of this style depending on the artisan brewer. These unflavored blended and secondary fermented Lambic beers may be very dry or mildly sweet and are characterized by intensely fruity-estery, sour and acidic flavors. These pale beers are brewed with at least 30% unmalted wheat, malted barley, and stale, aged hops. They are very low in hop bitterness. Cloudiness is acceptable. These beers are quite dry and light bodied. These beers, also known by the names Framboise, Kriek, Peche, etc., are characterized by fruit flavors and aromas. The intense color reflects the choice of fruit. Sourness predominates the flavor profile. These flavored Lambic beers may be very dry or mildly sweet. Only fruit beers using a Lambic as their base are found in this category.